Palestinian Christians attacked the convoy of the Greek Orthodox Patriarch of Jerusalem during a visit to Israeli-occupied West Bank on Saturday to protest the church’s controversial property sales to Jewish and Israeli buyers. The Greek Orthodox Church claims it is the second-largest landowner in Israel, but in recent years, the sale of prime real estate has stirred controversy among both Israelis and Palestinians. The church says it owns nearly 30 percent of Jerusalem’s Old City and a large portion of the Church of the Holy Sepulcher, which holds the traditional tomb of Jesus. Hundreds of demonstrators blocked Patriarch Theophilos III’s convoy, throwing stones and eggs, and shouting “traitor, traitor,” as he drove to a church in Bethlehem to mark the Orthodox Christmas Eve, NPR’s Daniel Estrin reports for our Newscast unit. Most of the Eastern Orthodox Church celebrates Christmas on Jan. 7. 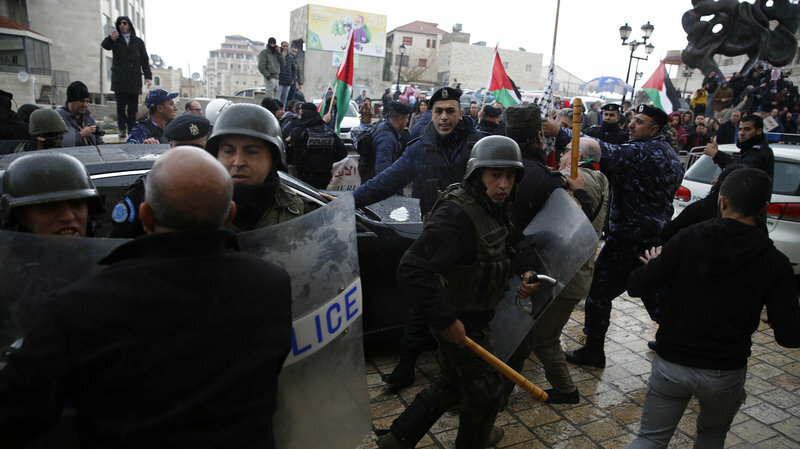 “What happened today is a message to the Palestinian Authority and to Jordan that we will not allow this traitor to stay in the Church,” one protester, Elyeef Sayegh, told Reuters. The mayor of Bethlehem boycotted the arrival ceremony and an official says Palestinian Authority President Mahmoud Abbas would not attend the church leader’s traditional Christmas dinner. The real estate deals were only recently made public after it was revealed that church leaders, who are mostly Greek nationals, quietly sold properties in the Holy Land to mysterious Jewish buyers fronted by companies overseas. Many members of the church’s largely Palestinian following say selling property to Israelis amounts to treason. Church officials claim they need to sell the land in order to consolidate debt, according to Reuters, and they also say the profits are being invested in the local Palestinian community. Reuters reports that some Israeli lawmakers are working to block the sales amid concerns they could cause real estate prices to spike. “None of these deals are endangering the future dream of the Palestinian people. None are siphoning off endowments,” said a Greek Orthodox Patriarchate official who spoke to NPR in December on the condition of anonymity. The land-ownership controversy began over a decade ago with the sale of two hotels near the entrance to the Old City. Then-Greek Orthodox Patriarch Irenaios was forced out and replaced by Theophilos who is fighting in Israeli court to annul the sales. But Theophilos faced backlash this summer after reports he personally approved other property sales.